Big, Bold, Beautiful Food: Ninette is Back: Naan Bread ... Or Is It Roti? Ninette is Back: Naan Bread ... Or Is It Roti? To go with chicken tikka masala, I wanted to make some flatbread to dip into the sauce. When I order chicken tikka masala at the Indian restaurant, I always get a side of naan. Naan is a slightly puffed flatbread, and it has a light smoky taste from its quick visit to the tandoor. I was familiar with making an unleavened flatbread dough for scallion pancakes, which is flour, water, salt, and sesame oil. I figured naan must be similar but use milk/yogurt instead of water and ghee (clarified butter) instead of sesame oil. It may have yeast or baking powder, but I decided to stick with unleavened dough. Here are my ratios for making flatbread: 1 part flour to almost 1/2 part of liquid. Splash of oil/fat for tenderness and salt for seasoning. A little sugar if that makes sense. For me, the sugar is not necessary for scallion pancakes, but since naan has milk in it, I thought a little sugar would be nice. I let the flatbread dough rest for 30 minutes until the gluten relaxed, and then I cut it into 5 pieces. I rolled them thin, brushed them with ghee, and then we cooked them on a hot grill. They were crisp yet flexible -- perfect for dipping into the chicken tikka masala sauce. If it had been winter, I could have easily cooked them on a hot skillet, although I do know that this is the way you cook roti, which my friend Mala taught me to make. Her roti were also a little thicker and softer. So here lies the issue of whether this bread is naan or roti or something in between. 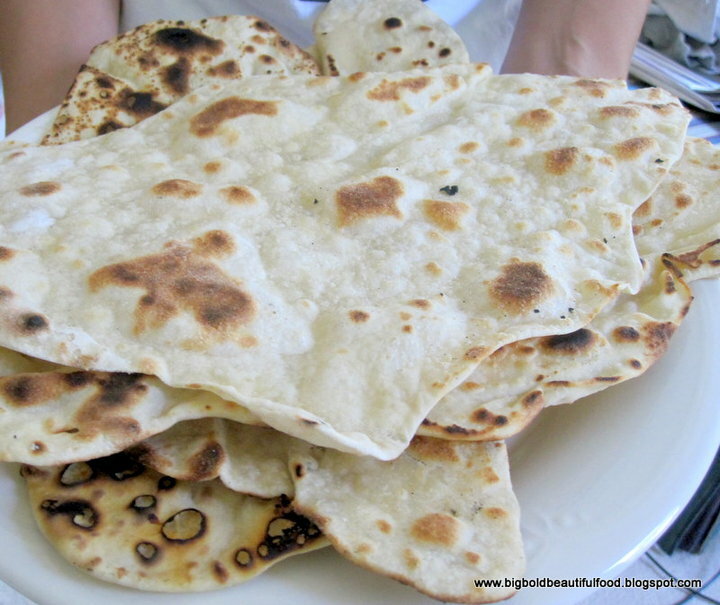 Is naan always leavened or can it be unleavened? Does the method of cooking -- on the grill/in the tandoor -- make it naan? Does the use of white flour make it not roti? I don't know the answer, but I do know that whatever we made was terrific. Put flour in a bowl and mix in salt and sugar. Make a depression in the middle (I use the bottom of a 1 cup measuring cup) and pour in milk and oil. Using a fork in a circular fashion, take the flour from the edge of the depression and slowly incorporate it into the liquid. When you can no longer use the fork and have a shaggy dough in the bowl, dump it out onto a floured board. Lightly dust your hands with flour and knead the shaggy mass until it becomes a smooth ball of dough, about 10 minutes. As with any dough, you may have to add a little more flour as you knead (it depends on the humidity in the air). Wrap the dough in plastic and let rest for about 30 minutes. Cut into 5 pieces and roll on a floured board (flour your rolling pin too) until you have oblong shaped of thin dough. Brush with oil and ghee. Preheat grill to 500 degrees and make sure the grates are clean. Place dough on grates and when it bubbles and is dry on the edges (a couple minuted), flip it over and cook the other side for a minute or two. The flatbread will cook quickly. Before serving, you can brush the flatbread again with ghee or leave it plain. I love naan! I used to look forward to ordering it everyday just so that I could have something warm and chewy to have on my walk back home after work. This is definitely a recipe that I am looking forward to making soon! Great bread. I love both Naan and Roti. Welcome back...I am about to go through a move myself and as I was packing my kitchen yesterday I was reminded of you. The fact that you are back and posting again is the encouragement I need to know I can get through a move too! PS..on the bread...whatever it is...it looks and sounds wonderful!